Elbe River Pilot Ship "KAPITÄN HILGENDORF"
FUCHS model number FU 25. This model represents a great German pilot ship that served at the approaches to the Elbe River near Hamburg for more than 40 years. To get a good understanding of the duty that these men and their vessels perform go to www.elbe-pilot.de (in German and English). The pilot ship "KAPITÄN HILGENDORF" (German LOTSE = PILOT in English) served from 1957 to 2000. She is 55.1 meters in length, 9.5 meters in beam, and 5 meters in draft. I suppose that she is named after the legendary captain Robert Hilgendorf who set several passage records in the nitrate trade around Cape Horn in the 5-mast bark POTOSI of the Ferdinand Laisz Line, in the late 1890’s. This is a very well made model. Because of its small size, the 2x to 2.5x photographic magnification really misrepresents her true appearance to a noticeable degree such as having a heavy paint job and oversized spars. 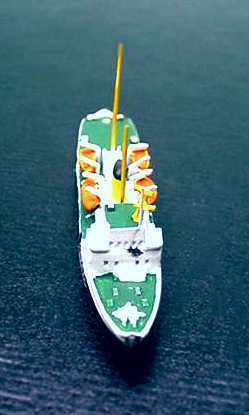 The direct visual observation shows that this is indeed a very finely detailed little model with a clean and thin coat of paint and expert workmanship. 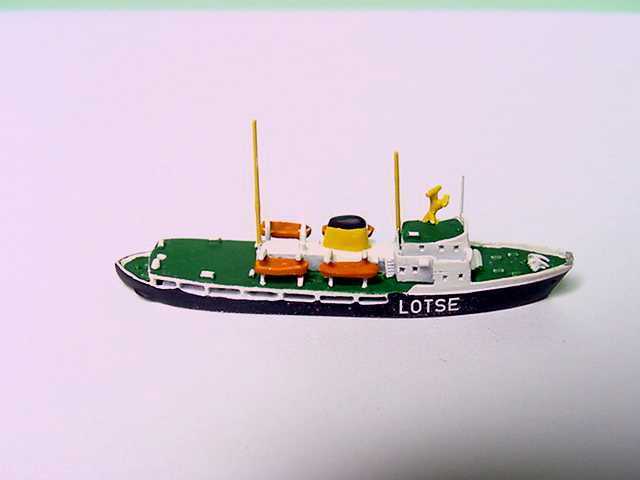 There are some very well-made small 1:1250 commercial and military tugs, and other small ships, that seem to be ignored by beginning collectors who may feel "big and-famous-is-best". 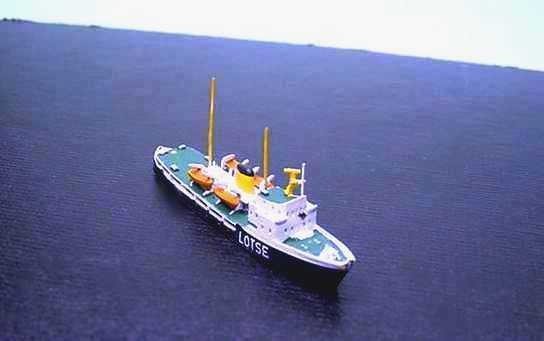 I have drifted slowly toward these tiny ships like the French naval tugs made by SMY and the great lightships (and lighthouses) made by Pharos. 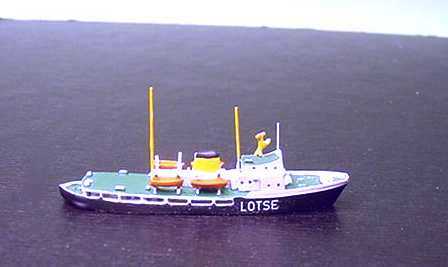 It seems to me that small ships at this scale really test a maker’s skills!